This Easy Red Pepper Jelly makes an amazing holiday appetizer! Serve this jelly over cream cheese and serve on your favorite crackers. 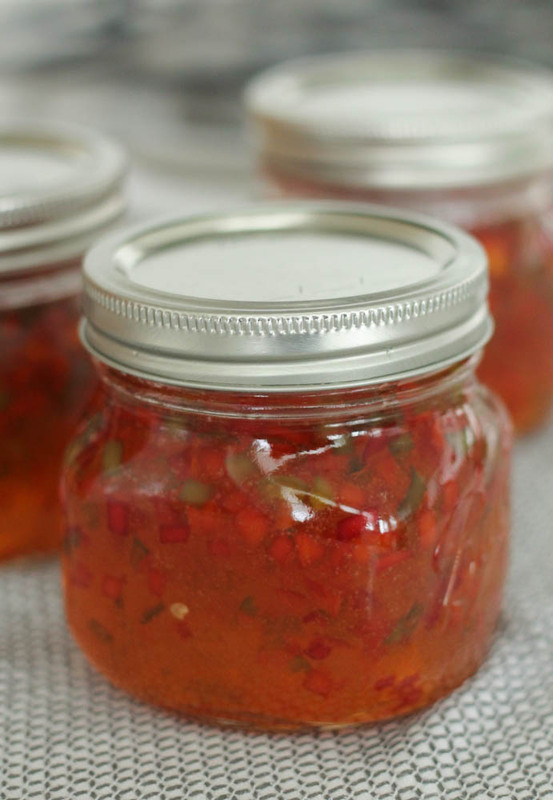 With fresh red peppers, green pepper and jalapeño, this Easy Red Pepper Jelly is perfectly sweet with just a little kick! One of my absolute favorite things about the holidays is going to holiday parties. I love spending time with family and friends, catching up and making new memories. 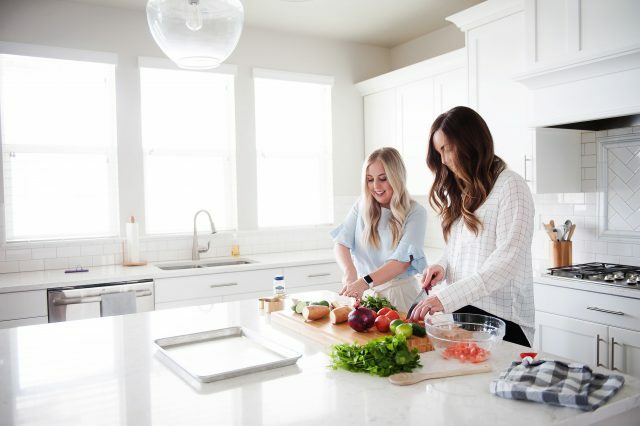 All of our family and friend holiday parties are centered around food, especially appetizers! This Easy Red Pepper Jelly has always been a staple at our holiday parties. This Red Pepper Jelly can easily be adapted to fit the taste of your party guests. If you are worried about it being too spicy, you can always leave out the jalapeño. Because the seeds are removed from the peppers, it takes away most of the heat. This Easy Red Pepper Jelly is actually really sweet! 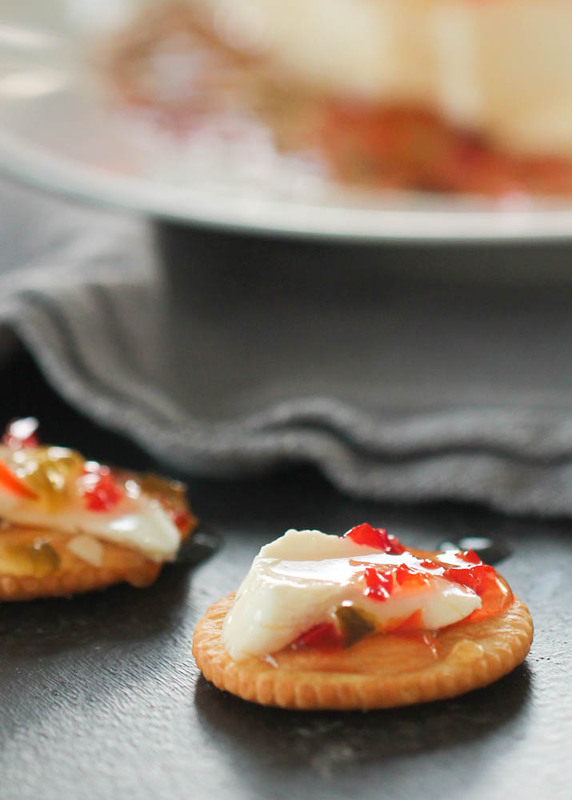 We love serving this pepper jelly over a softened block of cream cheese with Ritz Crackers. The creaminess of the cream cheese goes perfectly with the sweet, red pepper jelly. I was a little nervous to make this recipe because I have never canned anything in my life! I was honestly so surprised how easy it was to make this Red Pepper Jelly! I originally planned on giving it away as neighbor gifts, but it was so delicious, I am considering holding onto to serve at all our upcoming holiday parties. Don’t tell my friends! I started by sanitizing my jars. You can use three 16 ounce jars or 6 8 ounce jars. If you are going to be making this Easy Red Pepper Jelly as a gift for friends, I would use smaller jars so you can share with more friends. Next, I minced my red bell peppers, green bell pepper and jalapeños after I had removed the seeds. Be sure to cut these as small as possible so no one gets a huge bite of pepper when they are eating it. I added my peppers to a large saucepan over medium-high heat and added a cup of apple cider vinegar. Mix in a package of pectin powder after you add the vinegar. Continue stirring until your pepper mixture comes to a rolling boil. 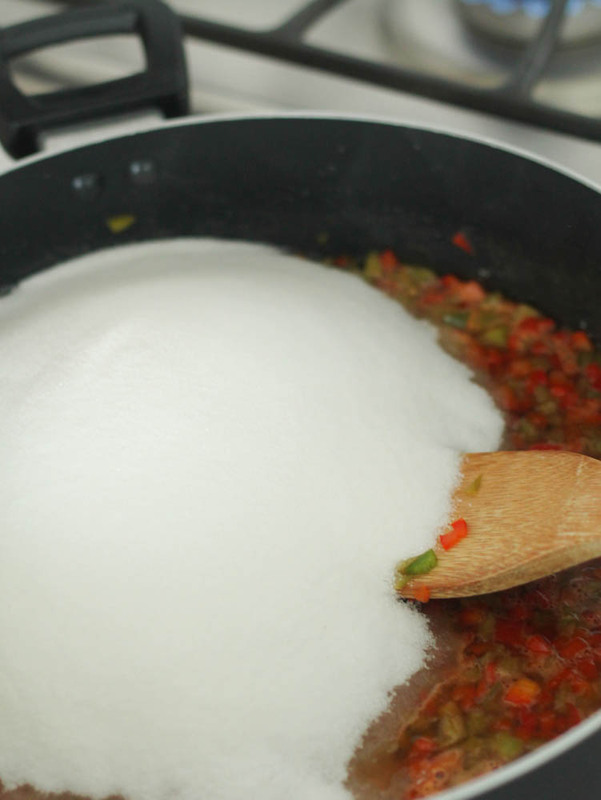 Remove the pan from the heat, add your sugar and mix it in then place the pan back on the heat. Turn the heat up to high and bring to a rolling boil while stirring constantly. Once you hit a rolling boil, let it boil for a full minute then remove from heat. Ladle the pepper jelly into your prepared jars. Keep in mind that the peppers will on be on the top, so be sure to evenly distribute the jelly so all of your jars have peppers in them. 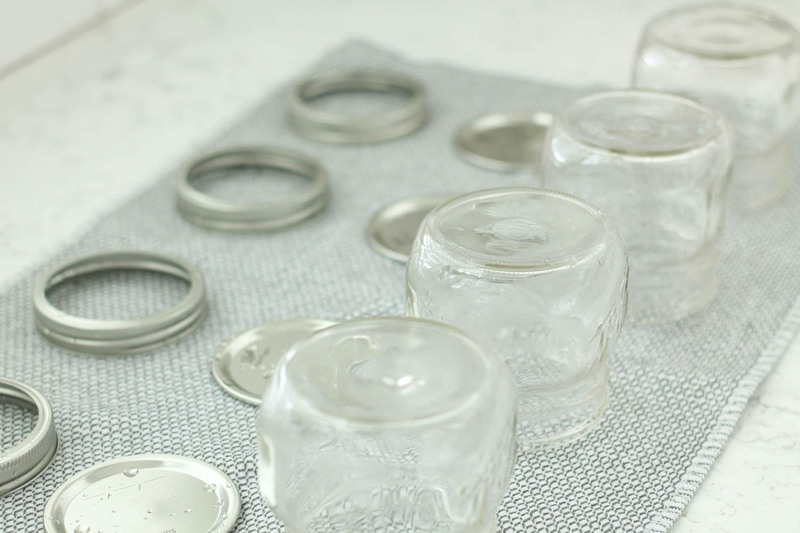 Cover your jars with the flat lids and then screw the bands on tightly. Place the jars in a pan filled with hot water over high heat. You want to be sure your cans are completely submerged. Bring the water to a boil, then let them boil for 5 minutes. It might be a little noisy, but that’s ok! Remove the jars from the heat and let cool completely. 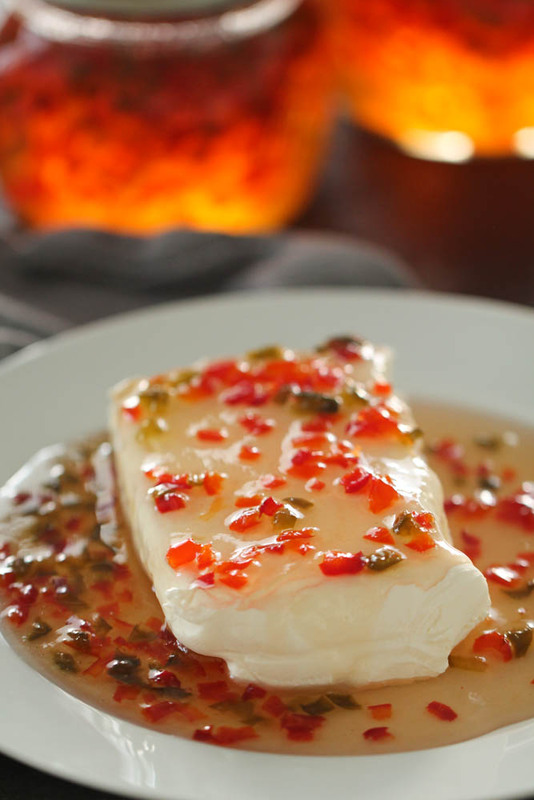 I like to serve this Easy Red Pepper Jelly over a block of cream cheese. It is easiest to eat when your cream cheese is softened to room temperature. You can dip crackers right into the cream cheese or serve with a spreader. Beware. This Easy Red Pepper Jelly is ADDICTING! Looking for other delicious appetizer recipes? This Easy Red Pepper Jelly makes an amazing holiday appetizer! 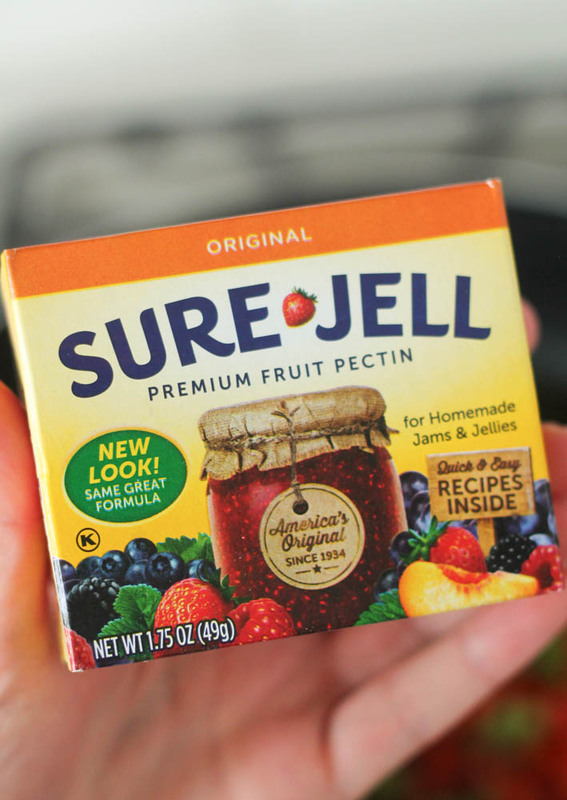 Serve this jelly over cream cheese and serve on your favorite crackers. 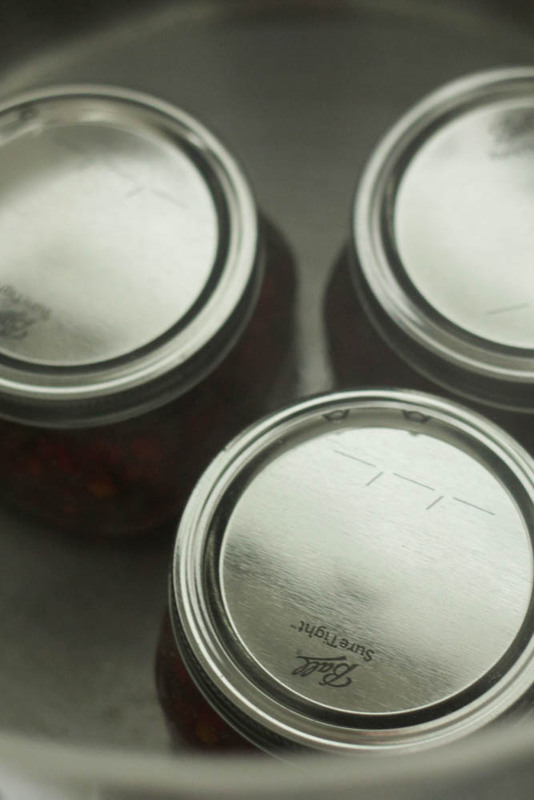 Sterilize canning jars and set aside. 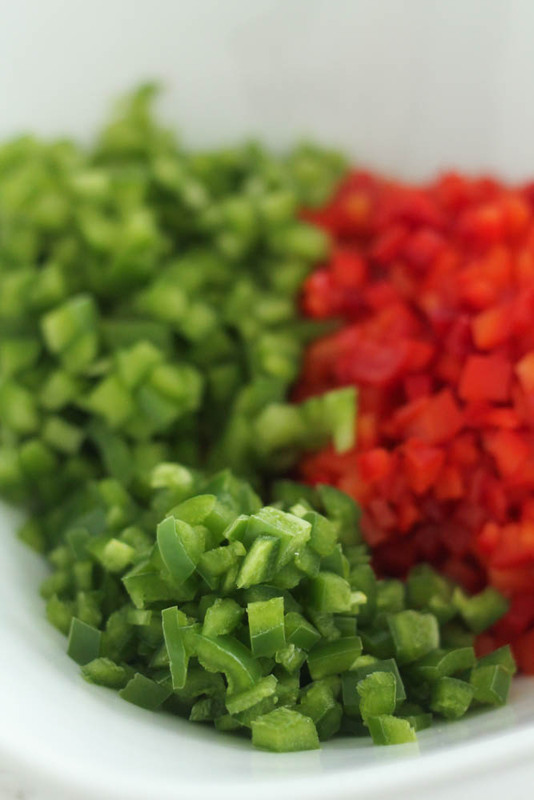 Prepare all peppers by seeding and mincing. 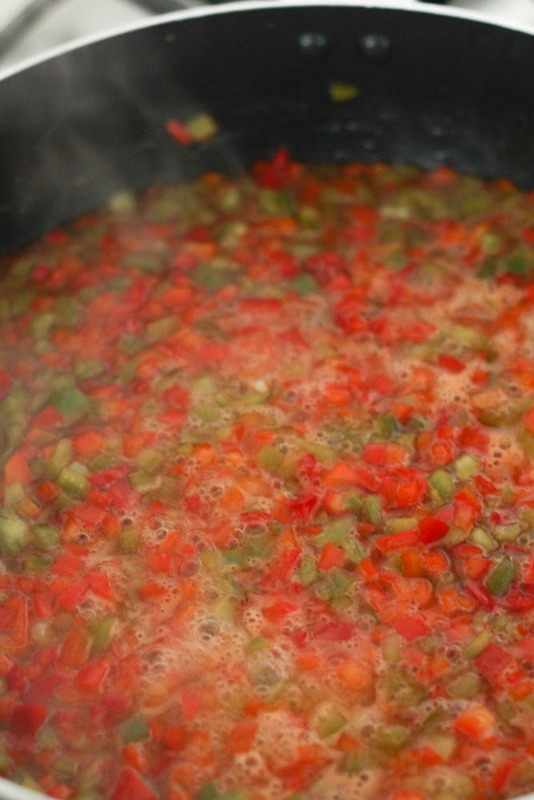 Place peppers in a large saucepan over medium-high heat. Add apple cider vinegar and powdered Pectin. 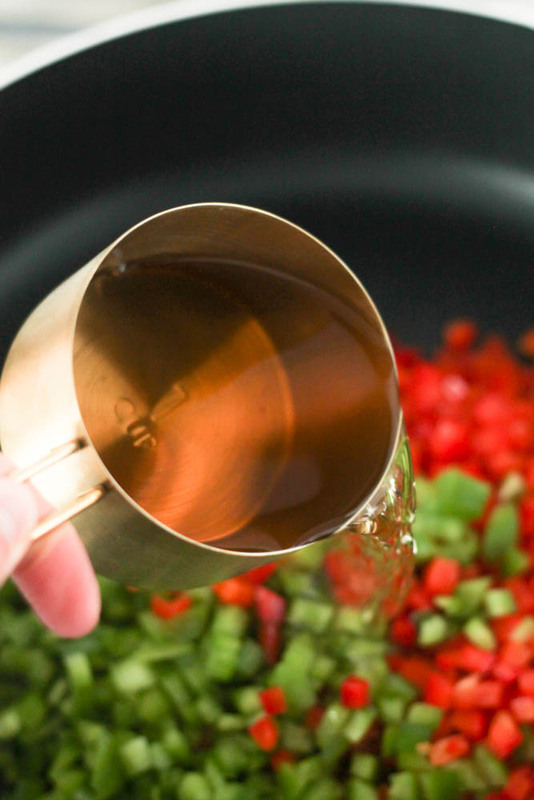 Bring heat to high and stir constantly until you reach a rolling boil. Remove from heat once you reach a rolling boil. Mix in sugar and return to pan to high heat. Return to a rolling boil and let boil for 1 minute. Fill jars with jelly until it reaches 1/4" from the top of the jar. Screw lids on jars and place in a large pot filled with hot water. Be sure jars are completely submerged. Heat water with jars over high heat until it reaches a rolling boil, then boil for 5 minutes. Remove from heat and let jars sit in water until cool. Check seals by pressing down on the center of the lid when cool. If the lid pops when pushed, it can be stored at room temperature, otherwise store in the refrigerator. 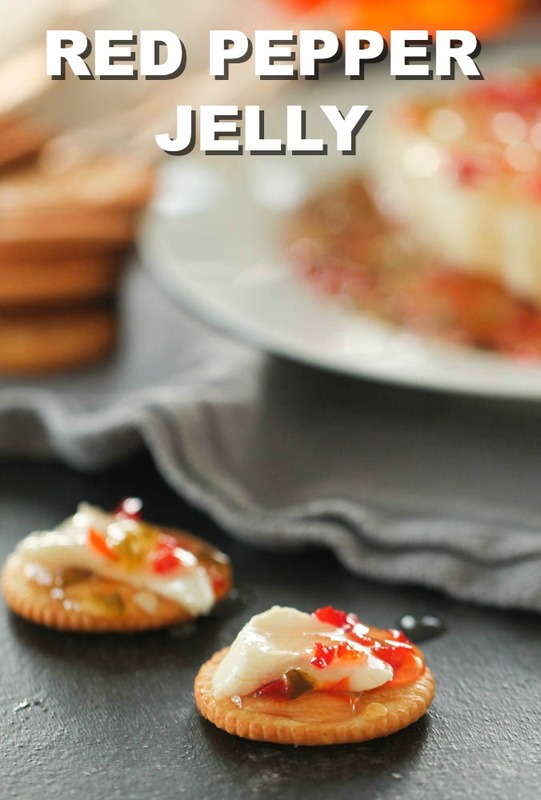 Pour jelly over cream cheese and serve with crackers. Our Slow Cooker Spinach Artichoke Dip is another easy and delicious appetizer you will love!